Aside from a couple of days in the office this week, I've been away since Christmas Eve, so I've had little opportunity to interact with Grace folks since then. Thanks to Rev Mel Caraway for filling in last Sunday. And BIG thanks to Ron Woodworth, outgoing chair of Trustees, for looking after the parsonage during the very cold temperatures this past weekend while we were away. Yesterday afternoon was finally warm enough for me to venture out to the church lawn and remove the Christmas Eve banner. Now my back is sore and my cheeks feel weathered and dry! But as I cleaned off and put away the stakes and everything else, I began to wonder: How did Christmas Eve go for people? Did they enjoy it? Were there obvious things missed? Christmas Eve fell on a Sunday in 2017. When this happens, some churches have no morning services at all, preferring to only emphasize evening worship. Others combine multiple services into one-- we did this last year, when Christmas Day and New Year's Day both fell on a Sunday. 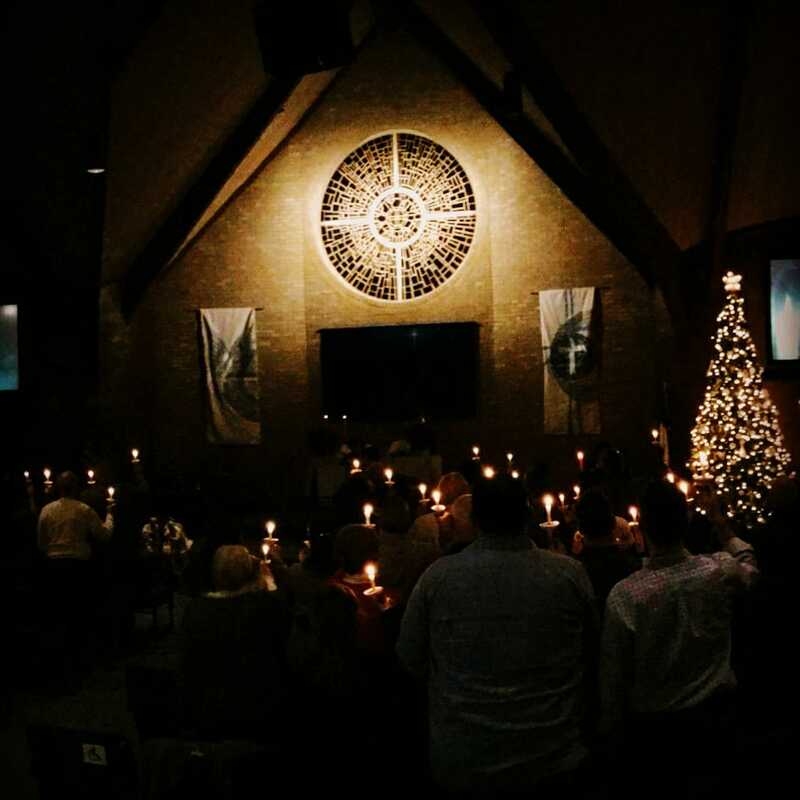 At Grace, we decided to keep our regular Sunday morning format, adding the Christmas Eve format we used last year. So we offered services at 8:30 and 11:00 a.m., 4:00 p.m. (children and families), and 7:00 and 11:00 p.m. (traditional candlelight services with communion). We received special offerings at 4:00/7:00/11:00, all of which were generously supported. Attendance was down from last year, both in the morning and at 4:00 and 7:00. 11:00 was about the same-- I guess midnight mass-type folk are very dedicated! Why were services less than last year? Were more people traveling? Are people less likely to attend on the same Sunday when multiple services are offered? Often when services are combined, folk who are committed to a particular hour do not show up, which is why we did not change our regular schedule. We changed our marketing strategy this year, moving away from postcards in the mail to ads on social media. Did this change negatively impact attendance? We're not overly concerned, just trying to learn. This situation will happen again in 2023; rather than making decisions based on memory or opinions, I created a survey to hear feedback on Christmas Eve 2017. Will you help us by filling it out? Click here. I hope your Christmas Eve was wonderful. Every pastor, church staff, and layperson in every church works hard to make services meaningful for everyone. Thanks to everyone at Grace who made this busy day possible! Tomorrow, 9:00-11:00 a.m.: Church leaders (outgoing and incoming) will reflect on 2017 and look to 2018. We’ll also set the budget for 2018, hear from Marsha Kahl about the emergency preparedness training event hosted by Sherman Police last month, and review materials for the Healthy Church Initiative weekend, Feb 16-18. Everyone is welcome and encouraged to attend. Everyone is invited to the parsonage for our annual Epiphany Party Sunday, 2:00-5:00 p.m. This is our opportunity to say thank you for having us as your parsonage family. Desserts and coffee will be served! Come and go.